Welcome to Door Hardware Products.com, We are located in the beautiful city of Wilmington NC at 2725 Old Wrightsboro Rd. Unit 2A in Airport Industrial Park. We offer residential and commercial Hardware and stock commercial, frames, Wood and metal doors, hardware, bath accessories, and bathroom partitions. We started out as a commercial installation company in 2000 and found that our customers needed a supplier that was willing to give better customer service than what they were getting from the standard door hardware suppliers. In 2013 we opened the doors to the Door Hardware Products Store and began building not just a business but a reputation. We go above and beyond for our customers, and this is the secret of our growth. 1. We do not concentrate on the lowest price but rather getting you the best products for your job. The best products however are not always the most expensive. In today’s global economy, name brands mean nothing as companies are bought and sold everyday, The hardware you may perceive as a quality piece, typically comes out of a factory in Mexico, China, Korea, or India that makes the same products for many other manufacturers at half the cost. The industry has found that they can charge a premium because they stamped a highly elevated brand name on the box and uneducated consumers don’t know the difference. 2. We will help you, And if we don’t know the answer we will find it and let you know. We routinely return phone calls and if you leave a message we will call you back. In Addition, If your spending $20 dollars or $20,000.00 we think your sale is important. 3. And Finally, We like to think of our company as an “Service company that Supplies” and not a “Supply company that Services”. 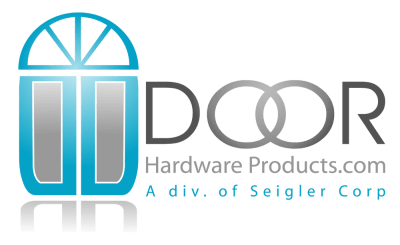 The difference is we try very hard to put the Service part first…..
President, Door Hardware Products a division of Seigler Corp.